Canadian band Seaway released their newest full length album entitled “Colour Blind” on October 23, 2015. Colour Blind follows up to 2013’s Hoser, and Seaway’s previous Ep titled All in My Head. 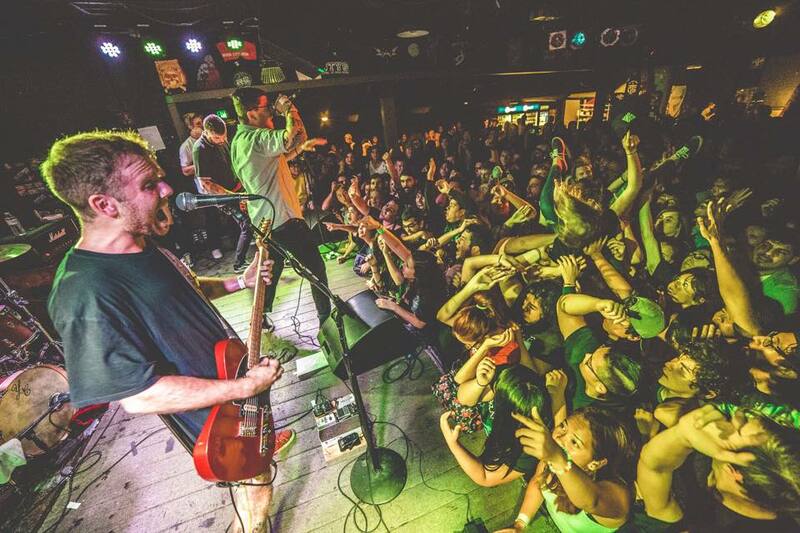 Before the release, various tracks were able to stream online which helped to gain excitement and a following for the album and allow fans to preorder, as well as promote the current tour with Knuckle Puck and Sorority Noise. Since it’s release, the album encompases an energy that is very unique to Seaway, as well as the typical pop punk sound and genre. With so many new albums in the scene this year (State Champs, Neck Deep etc. just to name a few), Seaway still stand their ground as Colour Blind fits the mold of the scene, but also surprises as a whole and stands as it’s own unique and fun album. With various fast paced tracks such as “Best Mistake”, “Freak” and “Slam” the album is fun and has an energy to keep one’s attention, as well as hit the emotional sides with tracks such as “Goon” and “Turn Me Away”. Colour Blind definitely is an album that will have you singing along and get one excited to see Seaway play some songs live on the current tour this fall. Purchase Colour Blind : Cd or Digital HERE! ~ Catch Seaway on Tour alongside KnucklePuck ~ DATES HERE! The internet has won out again… as the familiar Dancing pumpkin headed man takes on a whole new challenge: Today’s music. Here is a compilation of various videos around the internet of this meme dancing to some great tunes, which is all amazing and quite relatable…as dancing pumpkin man is all of us. Enjoy some laughs and hilarity with the videos below! Happy October! So, starting a new category of music fun on this blog – MORE TOP 10 POSTS! I want to start doing a few a month, so leave me comments and enjoy! Mariana’s Trench are a band who started out in Vancouver, BC in early 2001. Producing three albums and touring, they have gained a fanbase widely in Canada and various other countries, but seem somewhat unknown in the states and are highly underrated compared to other musicians topping the charts. Most well-known for his ever changing hair color, tight pants, dancing and vocal range, the frontman and lead singer, Josh Ramsay, has a very inspiring story. Josh Ramsay was born June 11, 1985, grew up in a very musical family, with his mother being a vocal coach and his father owning a recording studio. Ramsay also shared the love of music and started singing at the age of 13. Throughout high school, Ramsay struggled with an eating disorder, anorexia nervosa and bulimia nervosa. Many Mariana’s Trench songs are dedicated to the singer’s personal struggle through this such as those entitled, “Skin and Bones” and “Feeling Small”. Later on toward the end of high school Ramsay developed an addiction to heroin,often causing him to be kicked out of school and be late for band practices and shows. He later went on to go to rehab where he wrote a letter about his drug addiction in which he later turned into a song called “Lover Dearest”. Throughout his struggles with eating disorders and drug addiction, Ramsay kept music as his end goal and his determination to over come it all, which can be taken as a positive message to others with one’s own personal struggles in life. Humor is a big part of Mariana’s Trench. With various videos displaying the band’s off stage antics, hilarious music videos or even behind the scenes with the comical “Matt Webb Hours”, this band will make you laugh somehow. Yupp… you heard it here, this little known Canadian band has many connections. From being found by Nickleback frontman, Chad Kroger to even Josh Ramsay himself finding Carly Rae Jepsen and helping her rise to fame, this band has a lot of pop culture covered. Ramsay has appeared in a few guest vocal spots, once in Jepsen’s “Sour Candy” and in R&B artist Danny Fernandes “Hit Me Up”. The dance moves are everything. Check out some of Josh Ramsay and the band’s finest moments, out of hilarity with puppets, dressed as pirates to even breaking it down in a middle of a 1920’s scene… Mariana’s Trench has it all and the moves to prove it. Mariana’s Trench is releasing their fourth studio album entitled “Astoria” due in October, along with plans for a tour later in the year. Singles such as “Here’s to the Zeros”, “Pop 101” and “One Love” have been released, and get one even more excited to hear “Astoria” in the full.